La Belle Province – A Girl, a Car, a Camera. I won’t bore you with the two page rant I originally wrote on my experience at the Vipassana Meditation Center. The short version is that it was too much religious mumbo jumbo for this atheist. Especially considering they claimed to be non-sectarian. I lost count of the amount of times I heard ‘This is not a sect’ when they clearly carried on in a very cult-like, religious manner. The push for donations at the end was coercive and riddled with guilt. Having said that, I am grateful for the peaceful environment in which I was able to observe myself, and my thoughts, without distraction. I gained back a lot of my creative energy that I thought I had lost for good. I’m not completely put off by meditation, as I did have a few positive experiences, but I may look into a different way to go about it. The course was over Sunday morning. I drove Robyn, a fellow meditator, to Montreal with me, and was grateful for having someone to chat with. She is originally from Halifax, but flew in to attend the course. We may hook up again in Halifax when I finally make it out there? And so, Montreal, mon amour, I loved you and left you. I’ve been enough times in the past to know that you are wonderful, so just a short stay to catch up on emails, lunch, coffee, and then off to Quebec City. I took a walk around the old part of town, which is just as charming as it was when I last saw it last, ten years ago. With the day still young I drove off twenty minutes east to a picturesque island called Île d’Orléans (photo above). The bridge to the island spans five kms over the Saint Lawrence River. There is a main road which encircles it, that takes about an hour to drive, and is well worth it. Pretty houses, colourful barns, massive ferries sailing by. A small piece of the world yet untainted by commercialism. Farther east, my little dinky car chugged its way up to 800m above sea level on its way to a town called Baie-Saint-Paul, Quebec. I found a discreet place to park the car and pass out for the night. Sleeping in my car has been better than I expected, not quite the Sheraton Hotel, but I manage to get enough shut-eye to face the next day with vigour. On some random website, I found a suggested scenic drive on Highway 362 from Baie-Saint-Paul to La Malbaie, and am glad I happened upon it. The route was lined with birch tree mini forests. The hills were steep and the road winding, which made for an incredibly fun drive. My favourite bit was driving half blind through the thick fog of a cloud and exiting out the other side to a killer view of the Saint Lawrence River, as if the heavens had opened up for me. I happened to catch a rainbow near the beginning of the drive, which you will see pictured below. Espresso and the best-ever-marzipan-croissant at a little cafe in La Malbaie, and shortly heading out to Gaspé, Quebec. Much love and au revoir for now! Hahaha! So funny Z! Can you believe I was at that retreat about 7 or 8 years ago! Just for a week end. I was so disappointed as well. Couldn’t believe the stupidity of it all, including me driving all that way for something I can do right at home: be silent and reflect. So, for you girl, no more Eat, pray and love! Just eat and love!! Happy travels! 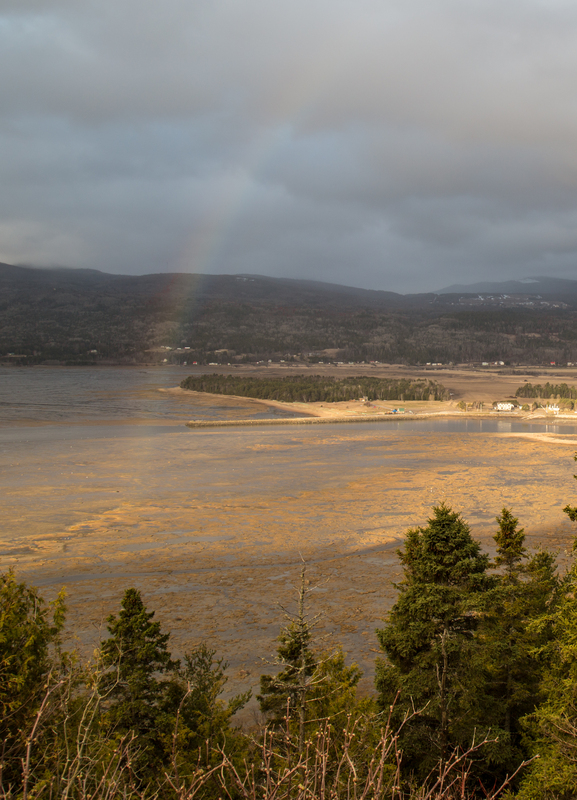 Pingback: Gaspé, QC to Moncton, NB | A girl, a car, a camera.